Ko Matua Peri tēnei, kua roa nei au e whakangaro atu nei i au anō. Heoi anō kua hoki kaha mai nei ki te whakahōhā i a koutou. Nā reira, tēnei te mihi manahau ki a koe Tākuta Rōpata Hepi mō tā tātau haere ki Pōneke ki te kite atu i ngā āhuatanga o te National Trust me ngā rangatira o reira. Ki aku hoa haere anō hoki ki a Jaz Hiko, Matua Wally Hooper rātau ko Cushla. Kia ora rā! Nō reira e te hoa, koirā taku wā tuatahi rāka te tirotiro haere i ngā āhua o tēnei whare me kī te National Trust. Ahakoa kua wareware i au ngā ingoa o ngā tāngata ka tūtakina atu, he haerenga e kore e warewaretia. Kia tūtaki anō ai tāua ki te hui i Tāngoio ā te 13/09/08. I te 30 o Here-turi-kōkā, 2008 ka whakahere mātau Te Kōhanga Reo o Waiohiki Marae i tētahi taumāhekeheke nui o te kōhanga reo, rakā ko te mahi hākinakina i te kōhanga reo tonu. Ko ngā mahi ko te mahi paihikara, te mau hū nui, te whiu pōro, te peke ki rō pēke, me te peke whetū. Ka mutu tēnā, ka mahi tauoma tānga (relay race). Ko tēnei kaupapa hei whakamana i ā tātau mokopuna hei whakamana hoki i ō tātau toa i haere atu ai ki Hāina. Tau kē koutou! I reira hoki ētahi o te whānau hei āwhina i a mātau i te wā o te hīkoi, te wā tuku i ngā mētara me te wā kai! Nō reira, ki a au nei he kaupapa tino whakahirahira, he kaupapa hei whakamana anō i a tātau, rakā te whakawhanaungatanga, te whakakotahitanga, te mana tangata, te whakapakari tinana, tuakana - taina, aha atu, aha atu, aha atu. Kua nui warea ahau e te mahi, kua kore au e whai taima ki te uru ki runga i te blogspot nei, na te mea, kua hiki au i te ara. Well we had a small but awesome hui on Saturday at Whaakirangi TKR. Nga mihi ki a Whaea Colleen raua ko Matua Rangiteaorere. I horahia ai te korowai o te manaakitanga ki runga i a matou. Na whai ano te korero, koia kei a korua, e nga tohunga o te manaaki ! We discussed several things at the hui all of which I will be posting as the week progresses. Our next hui will be held in Napier on the 13th & 14th September 2008. For more information, keep yourselves posted. Each week I will be posting 5 kupu hou (well they are kupu hou to me) for you to learn. He aha ko au anake ka waaua ai? Why is it that everyone talks about me? Taura Whiri have launched a new feature on the Korero Maori website, in advance of the launch of PATAKA KUPU - a new maori language dictionary in Te Reo Maori. The feature is an online language database. I have added the link for this as well. E tika ana ou koorero. The Kahungunu Rohe is not exclusively occupied by KAHUNGUNU IWI. Both Tamaki-nui-a-Rua & Wairarapa are areas in which Rangitaane Iwi have longstanding patterns of settlement & Mana Whenua. Rangitaane are descended from the ancestor of the same name who was born here in HERETAUNGA, and who was a descendant of WHATONGA - the first settler of the Heretaunga Plains. For more information use the Rangitane o Tamaki-nui-a-Rua & Rangitane o Wairarapa weblinks that I have added to the site or check out the Rangitaane ki Manawatu site. Tini whetu ki te rangi, Ko Rangitane ki te whenua ! We hosted our first group of overnight manuhiri here at the base. These whanau are the kaiawhina from Te Wairoa Kohanga Reo. Was late to the marae as I had to wait for someone to come here to pick up me, the whiteboard & all the rauemi (including the work books) for the hui. Definitely need to work on my personal organisation & management skills. Powhiri was a bit late, but went well. First workshop - Tikanga o te Marae - presented by Matua Tiwana & Whaea Yvonne Aranui. Second workshop - Te Wero - presented by Matua Hone & Whaea Alison. One super major disappointment. Nearly a quarter of those who were registered to attend were a no show - and phone calls to their kohanga reo resulted in only a handful being contactable. It appears that some whanau had the wrong date, and others weren't sure if they should be there (even though they registered and I replied.) Super major disappointment because the spaces that were left unfilled could have been filled by other whanau who had approached me after registrations had closed and I told them that there was simply no room. Thank goodness a couple of whanau turned up without announcement or registration. support whanau & kaimahi develop their reo, KURA REO was a resounding NEED. Whether the venue or timing was not conducive is yet to be ascertained, but with the kura reo over, I am still to hear word from those whanau who registered and who did not show. But, hei aha ... I'm not angry - kua papouri ke. There are several (expensive - I might add) mistakes in the workbook ! Shock horror ! This is definitely something I will work on. Well at the end of the day it cost me $70 worth of chocolate & ice cream. Classes went well. Well at least I enjoyed them. There are some really awesome whanau out there, some of whom I have never met before but whom I will never forget. A few other little hiccoughs here and there but otherwise a very productive day for me. Yet more last minute whanau, but still cool. Because of the programme it was a somewhat shorter morning with less time. Tried a different plan of attack. Another small rainstorm of minor problems, but again otherwise fine. If I was to summarise my thoughts of this hui in one word it would be - Satisfactory. Alot of those who attended are interested in having another one in the near future, and if we can we will. I have definitely learnt alot about how to organise these hui and to run them (or at least what not to do), something I look forward to sharing with whanau once the boys and I do our final synthesis of the feedback. Stop fighting it ! Korero Maori ! Kia ora ra. ka mau ke te wehi. anei oku whakaaro e pa ana ki nga korero kei to tatou blog. 5. TAMAKI NUI A RUA The fifth district encompasses what is called Southern Hawkes Bay & is centred around Dannevirke. Covering what was once called 'Ninety Mile Bush' - it reaches all the way from Norsewood in the north down past Pahiatua to Mt Bruce in the south. Here, Ngati Rangitaane, another iwi, who as tangata whenua sit within the rohe Kohanga Reo o Ngati Kahungunu. sorry to see the wananga has been changed, let us know when we can get together sometime in the future. 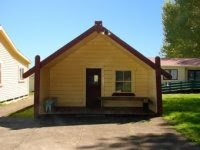 Check out the Whaakirangi Marae site - I just added the link. Yet another awesome site - loaded by more of our awesome kohanga reo whanau in Te Wairoa - Whaea Vilma Hape & Matua Charlie Lambert. Ki te kore e tika Te Reo, me pehea hoki ko Te Whariki? Ki te kore e tika a Te Whariki, me pehea hoki ko Te Reo?